The Federation of Australia on 1 January 1901 empowered the new Commonwealth Government under the constitution to make laws with respect to naval and military defence. This closed the era of colonial navies and ushered in, on March 1st 1901, the Commonwealth Naval Forces. 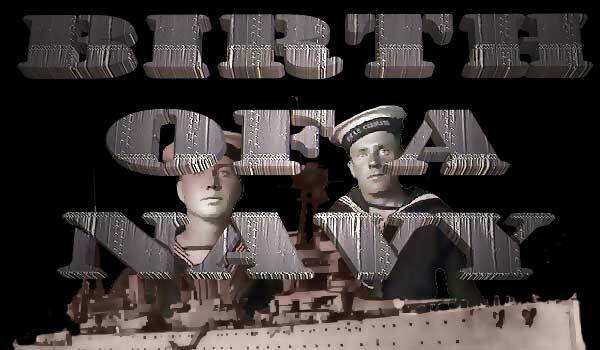 The ships and personnel of the individual states navies were placed under Federal Government control. There was an interim period of three years, however, until the Commonwealth Defence Act was proclaimed on 4 March 1904 and the post of Naval Officer Commanding Commonwealth Naval Forces was created. The infant navy faced many teething problems not least was the maintenance and manning of a rather sad collection of mostly tired old ships (including Cerberus and Protector, the torpedo boats Childers, Countess of Hopetoun, Lonsdale, Nepean and Mosquito, gunboats Paluma and Gayundah and some other smaller craft.Personnel totalled only 240 permanent members and a Naval Brigade of 1348. On 24 December 1904 the post of Director of Naval Forces was created, replacing that of Naval Officer Commanding, and on 12 January 1905 a Board of naval Administration was constituted. 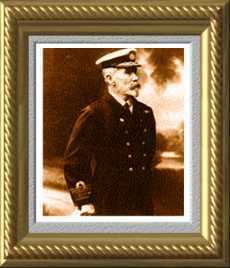 Its members were the Minister of Defence Mr. J. W. McKay, President; the Director of Naval Forces, Captain W. R. Creswell (pictured as a Rear Admiral) and Finance Minister Mr. J.A. Thompson. Captain William Rooke Creswell, more than any other man, had exerted a strong influence on the founding of Australia's Naval Force. Although a former officer of the Royal Navy, Creswell had never wavered in his fight for an autonomous navy despite the scoffing of some influential citizens who believed that Australia should shelter under the umbrella of the powerful Imperial Fleet and in return contribute to Royal Navy Funds. Creswell who had since 1893 served successively as state commander in South Australia, Queensland and Victoria, won the day through the support of leading politicians and the press. Busy times lay ahead for Creswell. he had inherited a defence service which in his own words was 'practically on the verge of collapse' and with insufficient trained me even to crew the hotchpotch of ships. there were only two Lieutenants on the Permanent List for seagoing duties. As a remedy Creswell recommended a seven year plan to bring into service three destroyers of 1300 tons, one destroyer of 800 tons and four fast torpedo boats. The Government sent Creswell to London in 1906 to discuss his proposals and to study naval development but the Committee of Imperial Defence declared that Creswell's proposed navy would have no 'strategic justification' and, indeed, would be a 'misapplication of naval power, opposed to every sound principal of naval strategy'. Naturally Creswell was disappointed with the ridicule levelled at his well-concieved plan but he was far from demoralized and on his return to Australia was encouraged by the then Prime Minister Alfred Deakin, who budgeted 250,000 pounds for expenditure on coastal defence including harbours. However in 1908 Andrew Fisher took over from Deakin and he had other plans for the 250,000. he was no less enthusiastic than Deakin for the development of Australia's own navy and his cabinet immediately approved a recommendation by Creswell for the procurement of 24 destroyers, three of which were ordered immediately without Admiralty consultation. Influenced no doubt, by the enormous expenditure which would be required over some years to establish the navy, the Australian Government appointed an ex-Royal Navy officer, Admiral Sir Reginald Henderson, as a consultant. henderson submitted a paper in March 1911 which proposed a massive fleet for that time of 52 warships, 15,000 men and six major bases, to be attained over two decades. It was far too ambitious for the financial resources of Australia with a population of less than 5 million. Never the less some aspects were adopted. Also on Henderson's recommendation the Naval Board was restructured in March 1911 as follows. Minister for Defence, President, Rear Admiral William Creswell, First Naval Member; Captain Bertram Chambers, Second Naval Member; Engineer Captain William Clarkson, Third Naval Member; and Staff Paymaster Henry Manisty, Finance and Civil member and Naval Secretary. It was a momentous occasion for Australia when on 10 July 1911, King George V approved the designation 'Royal Australian Navy'. The Naval Board finally promulgated the new designation on 5th October 1911 and pronounced that henceforth Australian Naval vessels were to be prefixed with the words "His Majesty's Australian Ship" (HMAS). The board also ordered that all naval ships were to fly the White Ensign at the stern and the Australian flag at the jackstaff. And so a proud Navy was born! They were River Class Torpedo Boat-Destroyers of 700 tons with a top speed of 28 knots and were named Parramatta, Yarra and Warrego - The first new vessels destined soon to bear the proud prefix HMAS. 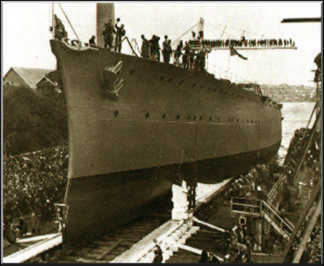 Parramatta was launched in February 1910 and, with Yarra, arrived in Australia nine months later. meanwhile a tender had been accepted for the building in Britain of the battle-cruiser Australia destined to become flagship of the fleet.